David Nugent (right) in action at Accrington on Saturday. Derby County will visit either West Bromwich Albion or Brighton & Hove Albion in the FA Cup fifth round. 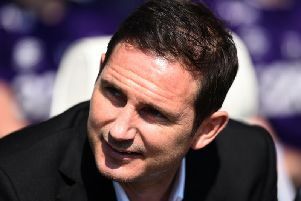 Following the 1-0 win at Accrington Stanley on Saturday, Frank Lampard's men will have to wait a little longer to see exactly which side they'll face over the weekend of February 15-18. Brighton and West Brom drew 0-0 at the American Express Community Stadium last weekend and will replay on Tuesday, February 5. The Rams have already visited West Brom once this season, romping to a 4-1 in the Sky Bet Championship. Brighton, who are currently 13th in the Premier League, haven't faced Derby since beating them 3-0 at home in March 2017.